Peanut Chikki or Peanut Brittle is one of the most popular Indian brittle recipes. 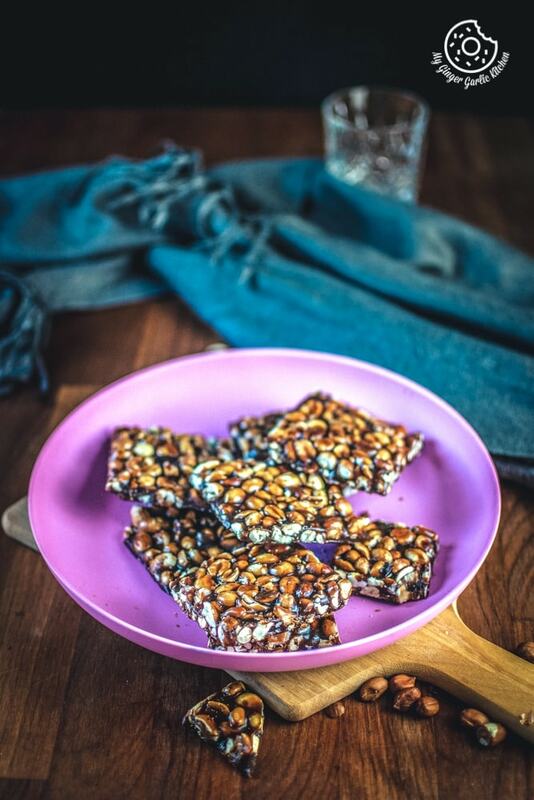 This chikki is a mash-up of peanuts and jaggery, prepared in a sweet candy like crispy bars. Peanut Chikki or Groundnut Chikki is one of the most exciting forms of savoring winter jewels ‘jaggery and peanuts’ together. 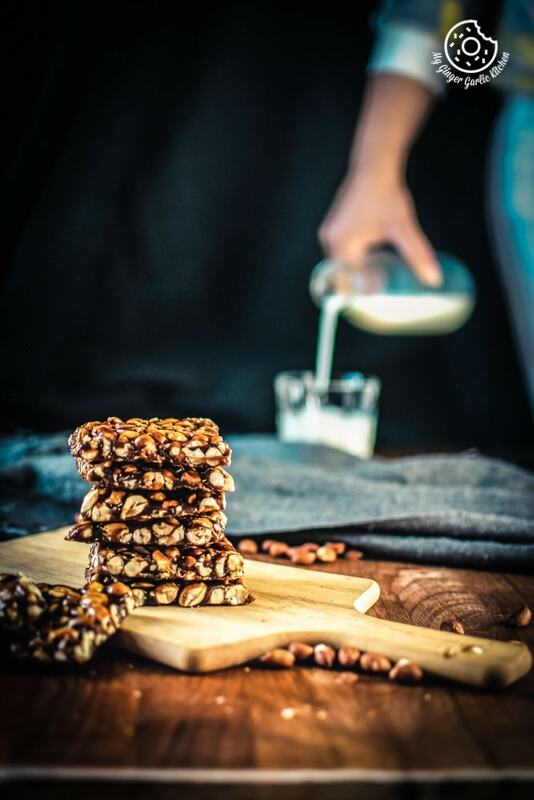 Peanut (moongfali/groundnut) Chikki aka Peanut Brittle is a healthy, delightful, traditional candy made from peanuts and jaggery. This peanut chikki has so many health benefits. In other words, Peanut Chikki is the Indian version of Golden Peanut Brittle. Brittle is a type of candy made up of flat broken pieces of hard sugar candy which are generally loaded with nuts such as peanuts, almonds, cashews, pistachios, or pecans. Brittle is made worldwide, and has many different varieties and different names. 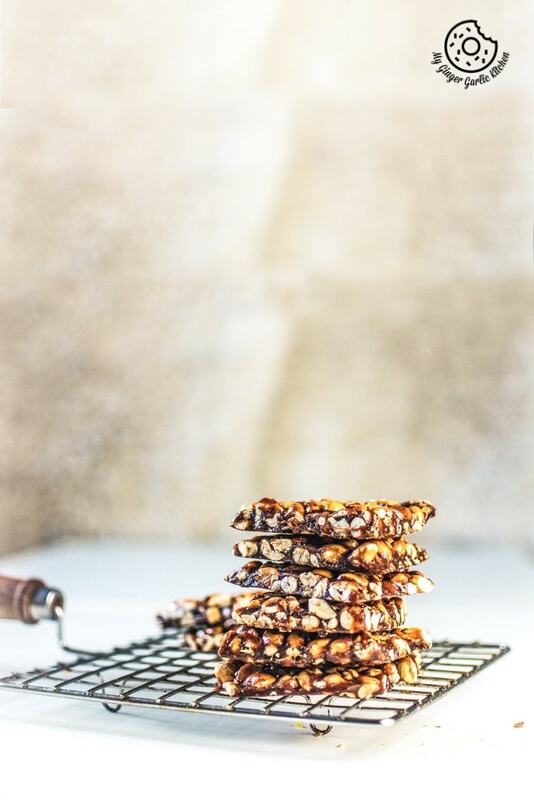 The Greek name for brittle is ‘Pasteli’.The French name is ‘Croquant’. In India, they are known as ‘Chikki’. Chikki (brittle) is a popular and traditional Indian sweet. This old-fashioned Indian sweet candy is made using just 2 basic ingredients — jaggery and nuts (generally peanuts, sesame seeds). Yes, it’s only made with nuts and jaggery. Chikki is a sweet which is mainly consumed during winter season. Thus this dish is also famous as a winter-special sweet. What are the main ingredients for peanut brittle? Main ingredients for making peanut brittle are: jaggery (gur), peanuts (moongfali), water (pani), and ghee/butter. What are other versions of chikki? There are also popular variations of chikki made with sesame seeds. This chikki is known as ‘Til ki Chikki’. Some special variety of chikkis are made out of cashews (kaju), almonds (badam), pistachios (pista), or a with mixed nuts. The mix nut chikki is called ‘Mixed Dry Fruit Chikki’. Most of the chikkis don’t have any flavorings, but some chikkis have favouring of cardamom (ilaichi), saffron(kesar), and gulabjal (rose water). While others have a touch of coconut. Then there is Puffed or Roasted Chana Dal/bengal Gram Chikki, Puffed Rice (Murmura) Chikki, Beaten Rice (Poha) Chikki, or Coconut (Nariyal/khopra) Chikki . Making perfect chikki at home is very simple and easy. The only thing which needs to be considered is the consistency of jaggery syrup. Because if you don’t cook the jaggery to the right stage, your chikkis won’t turn crispy. Chikkis would turn stringy, rubbery, chewy and soft if you don’t cook jaggery syrup the way it is intended. To get the sugar candy like consistency, you need to cook the syrup until the hard ball stage. The mixture is boiled to the hard ball stage at equivalent to a temperature of about 270 °F (132 °C). How do you make Peanut Chikki? Making perfect peanut chikki at home is very easy. This is made with just 2 main ingredients – peanuts and jaggery. For preparing peanut chikkis you need to first make the hot jaggery syrup with a very little amount of water. Then a little ghee is added to the jaggery syrup. Ghee is added because it helps to make it perfectly crispy and breakable. You want chikkis neither too chewy and soft, nor too crispy. Roasted peanuts are then mixed with the caramelized sugar/jaggery syrup to coat them perfectly with the syrup. This hot chikki/candy mixture is poured out onto a flat greased surface for cooling. This mixture is then pressed or rolled using a flat pan or a mortar to a uniform thickness. Chikkis are sliced when they are slightly hot, and then they are completely cooled. What are the other names of Peanut Chikki? Peanut Chikki is also known as ‘Groundnut Chikki’, ‘Moongphali Gur ki Chikki’, or Moongfali ki Patti. What type of jaggery is best for making chikki? You can make chikki with any type of jaggery. But if you want the perfect chikki then use the basic regular jaggery. No need to buy organic, unrefined, pure jaggery, or jaggery powder. Normal jaggery works great. Can I replace jaggery with sugar? Yes, definitely. You can make chikki using refined sugar. If you are making chikkis with jaggery then the name of jaggery is ‘Moongfali Gud Ki Chikki’ which means ‘Jaggery Peanut Brittle’. If you use sugar for making chikki then the chikki would be called ‘Shakkar Moongfali Ki Chikki’ which translates to ‘Peanut Sugar Brittle’. What sweetener is used as a base for chikki? Chikkis are either made with jaggery or sugar. Traditional chikkis are either made using a mixture of jaggery and water, or sugar and water. How do you serve Peanut Chikki? Peanut Chikki can be eaten alone as candy, or as an after meal light dessert. This is a perfectly healthy and delicious substitute for rich chocolates. Always look for the hard ball stage (which is around 270°F) while making chikkis. For making this peanut chikki, you need to cook jaggery till its temperature becomes approx 270°F. Before adding roasted peanuts into the jaggery syrup, you can check the temperature using a candy thermometer. If you don’t have a digital candy thermometer, then you can simply pour a drop of jaggery (gur) syrup in a bowl of cold water. Wait for few seconds before checking the consistency. The temperature is perfect if the syrup immediately turns hard and forms a solid ball. It gets hardened to a brittle consistency, at this stage it would be easy to snap. Cook for some more time if the syrup is not ready. Try to use regular jaggery for making chikkis. You can replace jaggery with refined sugar. The ratio of nuts and jaggery is 1:1 for making chikkis. However, if you want more jaggery in chikki then use 1 ¼ cups of jaggery for 1 cup of roasted peanuts. If you desire, you can also add other roasted nuts with roasted peanuts. I roasted peanuts in a pan. But if you want a fuss-free roasting, you can also roast peanuts in microwave. For microwave roasting, spread peanuts in a single layer on a microwave-safe plate. Cook for 2-3 minutes on high. Let them cool completely before removing the skin. Chikkis stay fresh at room temperature in an airtight container for up to 1 month. The final color of peanut chikkis depends on the type of jaggery you have used. If you have used golden brown jaggery then the chikkis will turn dark brown in color. If you have used yellow jaggery then the chikkis would come out light brown in color. For the ease of working, always spread mixture on a greased surface and use a greased rolling pin. Roll out the mixture when it is hot. It’s because it will be difficult to roll once the mixture cools down. Peanut Chikki ﻿or Peanut Brittle is one of the most popular Indian brittle recipes. 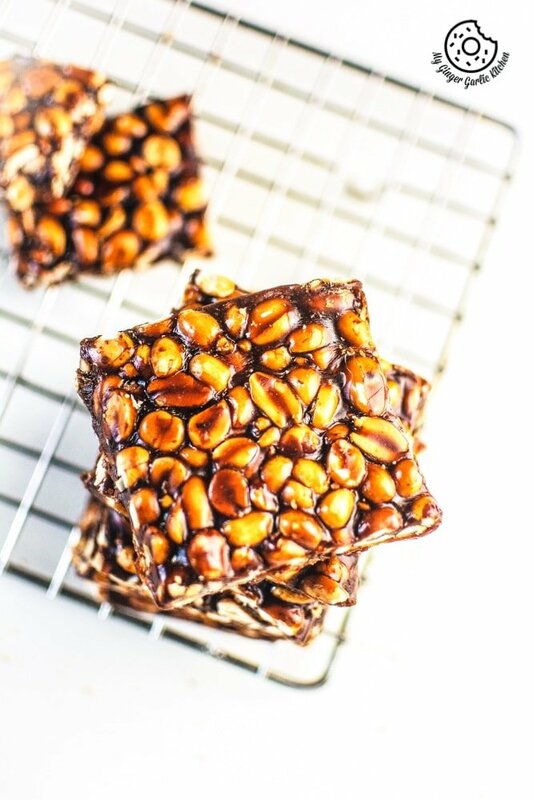 This chikki is a mash-up of peanuts and jaggery, prepared in a sweet candy like crispy bars. Peanut Chikki or Groundnut Chikki is one of the most exciting forms of savoring winter jewels ‘jaggery and peanuts’ together. Nutrition Info: 175 calories // Servings: 1 bowl, 4-rolls, etc. 1. Dry roast peanuts on a medium to low heat, keep stirring often. 2. When the peanuts are half roasted, the skin starts to come off. Keep roasting them until you get a nice roasting nutty aroma, and they become light golden in color. (To check doneness, take a peanut between your thumb and the index finger and rub it if the peanut has a slight golden color then they are done. 3. Remove from pan, and let them cool completely. Remove the skin by rubbing them between your palms. The skin would come off easily. Remove all the skin from the peanuts. Split the roasted peanuts as much as possible. Keep them aside. 1. Pour 1/4 cup water to a bowl and keep it near at hand for checking the consistency of jaggery syrup. 2. In a heavy pan or saucepan, over low heat, add broken jaggery with 3 tablespoons of water. 4. Jaggery would begin to dissolve, keep stirring until jaggery is fully dissolved. 5. When the jaggery is completely melted, boil it for 5 minutes. Stir occasionally. 6. Add 1 tablespoon ghee and mix well. 7. Keep boiling for 2 more minutes. Stir constantly until the jaggery syrup reaches a hard ball consistency. 1. Grease your worktop, knife and a wooden rolling pin. Instead of a rolling pin, you can also use the greased base of a flat steel cup. 2. When jaggery syrup is ready, add the roasted peanut to the jaggery syrup, and mix it well to combine. 3. Cook for 1 minute and turn off the heat. 4. Immediately pour this jaggery mixture onto the greased surface. 5. Quickly shape it to a square using a greased knife or a wooden spatula. 6. Roll with the greased rolling pin to a uniform thickness. You can also use a greased cup to even up the top. 7. Cut chikki into pieces using a greased knife while it’s still warm. 8. Cool it completely before taking out the pieces. 1. You can replace jaggery with refined sugar. 2. Store peanut chikki in an airtight jar at room temperature for up to 1 month.